The reintroduction of the Certificate for Teachers of Chinese to Speakers of Other Languages (CTCSOL) by Confucius Institute Headquarters (Hanban) came as a surprise to me. Since then, I had been through the hardships of exam preparations and tensions of examinations. After more than a year, I finally received my certificate. Looking back, bittersweet memories crowded in upon my mind. I remember that during the interview training course, I didn’t get to practice in front of the class as I lost my voice for two weeks due to fatigue and illness. As I sat by and watched my classmates practice in front of the class, I was very anxious because I had lost valuable opportunities to practice. I was filled with doubt as well: what if my voice did not recover in time? But I told myself, since I had come such a long way, I must finish this journey no matter what, even if I had to use gestures to express myself. Fortunately, I regained my voice the day before the interview. However, I was scheduled to be the first candidate through drawing lots on the first day of interview, which started at 8 am. It meant that I would be the very first CTCSOL interview candidate of Singapore examination center in ten years. Conventional wisdom holds that the bird which takes the lead is bound to be shot. Thus, before entering the interview room, I was so nervous that I asked to withdraw from the interview. At that time, Hui Chun, the staff of the HSK Centre (Crestar), encouraged me to take things as they come, and she practically pushed me into the interview room. During the interview, I braced myself to finish up all I had to say. By the time I walked out of the interview room, I was covered in sweat and my mind was a complete blank. I believe every interview candidate shares the same experience, not because of self-doubt but because we are eager for the certificate. Just as what the teacher had emphasized during trainings, it was a fair and standardized examination. There was no comparison across levels, or with other candidates, and you would pass the interview as long as you meet the requirements and standards of the examination, set according to the five modules covered in the Standards for Teachers of Chinese to Speakers of other languages. For this very reason, I successfully obtained my CTCSOL. What I’ve learnt from this journey is that we should march forward courageously once we set our goal, and we should keep on trying to discover our potential. Also, we can realize our dream only if we have faith in ourselves. 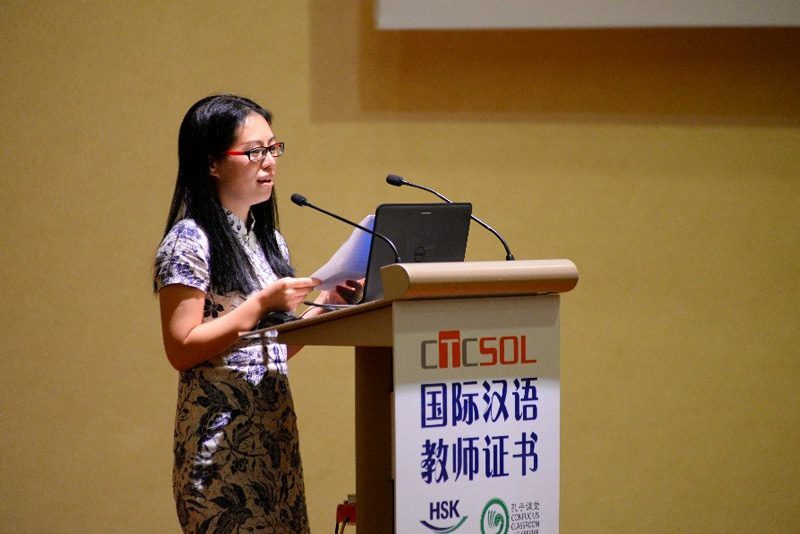 I would like to mention that the interview trainings specially offered by HSK Centre (Crestar) were very useful, especially the English training course conducted by Ms Xiong Huali. It was an interesting and useful course. After the training, I learned the basic skills of English interview, which helped me to achieve a score of IELTS 6.0 in the speaking module, and also gained recognition from a foreign principal for my excellent English communication skills. It had laid foundation for me to further study and to develop my career in international school. Lastly, I would like to express my gratitude to Hanban and HSK Centre (Crestar) because CTCSOL allowed me to challenge myself and discover my potential, so that I can take the first step to pursue my dream.